During the First World War 628 awards of the Victoria Cross were made. Here is a list of those servicemen who received the award. 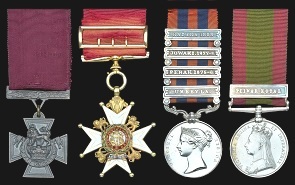 Recent acquisitions by Lord Ashcroft's Victoria Cross Collection. been completely refurbished in the Charlton Cemetery, Dover. has been refurbished in Charlton Cemetery, Dover. in Aldershot Military Cemetery has been knocked off its plinth. Listing Victoria Crosses that have been stolen, destroyed or lost. on behalf of the descendants of Private James Osborne. Included in this website on the Victoria Cross you will find an index of individual VC holder's names and a list ( by County & Country ) of the location of graves of VC holders in the United Kingdom, Ireland, and the rest of the world. Also displayed in this website is the location of all VCs when held by public bodies, world-wide. Accompanying this is a webpage announcing details of recent sales of Victoria Crosses. Following up the above specialisation is a 'News' webpage announcing recent events, ceremonies, auctions and upcoming VC projects. As an added bonus there is displayed, lists of Victoria Cross attendees at various important gatherings of VC recipients, such as the 1929 VC Reunion Dinner hosted by The Prince of Wales.